Emma in Bromley: Adventures of Grandpa Tidlo - Where in the World are the Grand Parents! Adventures of Grandpa Tidlo - Where in the World are the Grand Parents! We were sent a grandad to look after for the summer of 2012, from the John Crane Tidlo collection. This isn't any ordinary grandpa, he fits in your pocket! He's very cute, with wooly grey hair, a wooden top head and relaxed grandpa clothing. 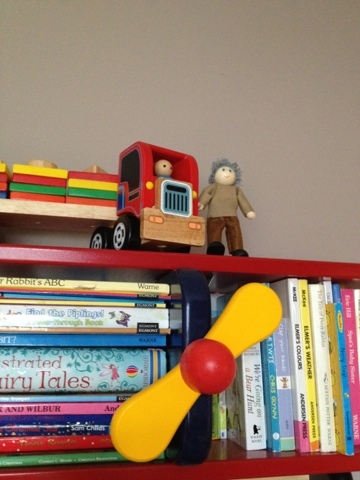 Grandpa did a spot of wing walking on Blake's colourful bi plane bookcase (incidentally, we bought this from John Crane just after Blake was born!) Grandpa still has plenty of thrill seeking left in him! - he's a bit of a dare devil, this one! 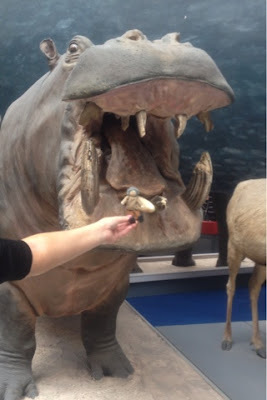 We took grandpa tidlo with us on our day out to the Natural History Museum in London where he was almost eaten by a hippo! He had a great time, but had to be held tightly by Blake (aged 2) when we went to see the dinosaurs as Grandpa got a bit scared! Grandpa also enjoyed a spot of tea and cake in the museum's cafe! Where in the world are the grand parents? I'll update this post with more adventures of Grandpa Tidlo soon!!! Cute! how was the Natural History Museum?